Pupusas have been part of the Los Angeles food culture since the 1980s influx of Salvadorans during civil war in their homeland. 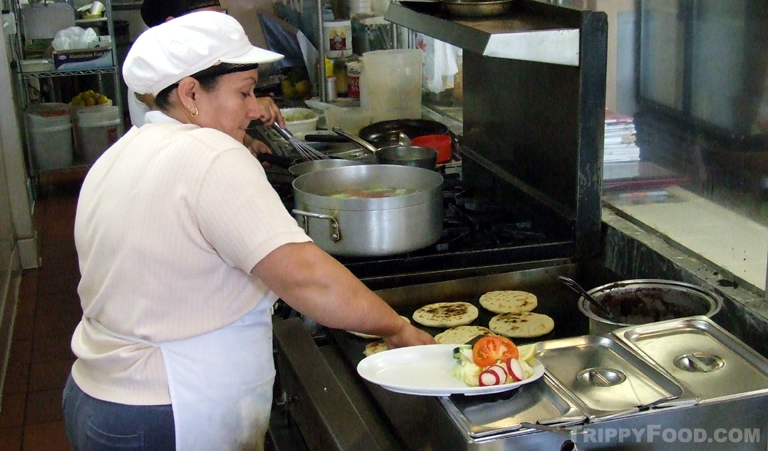 Salvadoran and Central American restaurants grill up pupusas by the thousands on a daily basis from windowless shacks to tablecothed bistros, with each carrying the basic three or four varieties and then throwing in one or two unique variations on the theme. To enjoy this simple yet filling food of the people of El Salvador for thousands of years, you need not look farther than your friendly neighborhood pupuseria (which admittedly sounds like something requiring Kaopectate). 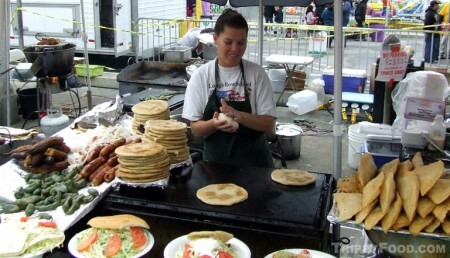 Pupusas are made from masa de maiz, slightly different than the corn masa used to make tamales; in some cases nixtamal is used, which starts with masa made from hominy (corn soaked in an alkaline solution), while other pupusas use masa harina (flour) or rice flour (in the case of pupusa de arroz). Most are filled with Salvadoran cheese (quesillo) and some other substance such as beans, meat or vegetables. 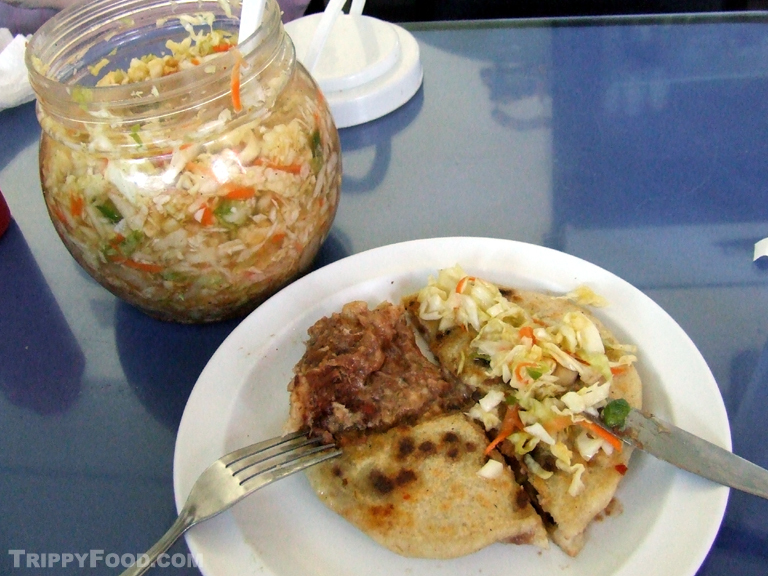 Fillings can be deceptive - a pupusa de chicharrón does not contain the crispy fried pork skin we're accustomed to, but ground pork filling instead. The pupusa revuelta contains chicharrón, beans and cheese and pupusa de loroco is stuffed with cheese and the flower buds from the Central American loroco vine, a vegetarian delight that tastes like a cross between baby asparagus and tender broccoli stems. The Minty (as she is known in blogging circles) recently organized a pupusa crawl along a one mile stretch of L.A.'s Beverly Boulevard. The idea was to hop from one pupuseria to the next, an easy and inexpensive adventure considering that pupusas range from one to three dollars apiece. The first stop was Atlacatl, a popular restaurant that looked like a movie Mexican restaurant, complete with what looked like velvet paintings of iguanas and armadillos (which I secretly prayed were menu items). 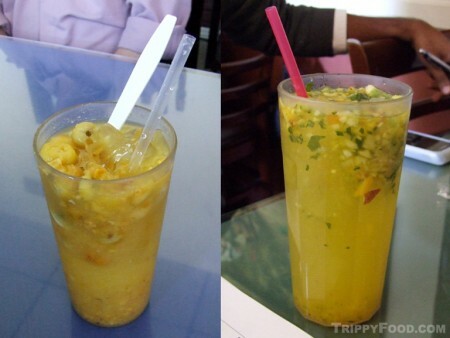 Some of the crawlers ordered ensalada (which I pictured to be something like a basic garden salad but turned out to be a Salvadoran drink). This sweet and fruity concoction featured finely chopped fruit, including apples, mamey, and what looked (but didn't taste) like cilantro. The juice figured to be an apple/pineapple mix, and the cool, sweet beverage would have been perfect with a shot of rum in it. Even though our host said that the pupusas were small, I knew I'd have to pace myself to hit the five designated pupuserias. I sensed danger when the pups began arriving, with each being about 8 inches across. I ordered the loroco, which tasted more like it had a filling of broccoli cheese soup rather than the taste of asparagus as advertised, and after enjoying the pupusa it was off to our next stop. 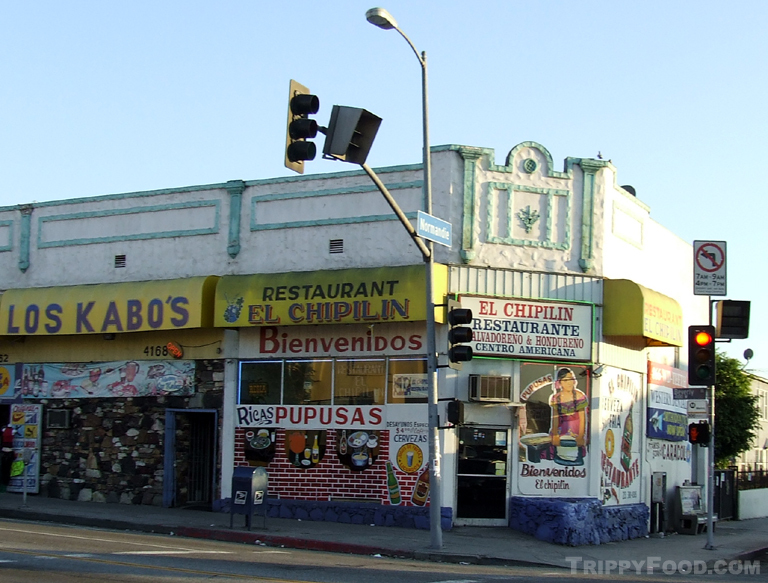 El Chipilin is a simpler place with mismatched silverware and dishes, but in my opinion featured the most flavorful pupusas we sampled. I ordered the mild pupusa ruvuelta which wasn't the all-out assault I thought it would be, and I liked the texture of the dish. One of the other guests allowed me to sample of pupusa de chicharrón which had a smoky aroma and firmer texture that was superb. Those who ordered ensalada to go with their pupusa got an unusual surprise - the inclusion of nance, a small yellow fleshy fruit with a pit almost as big as the fruit. Apparently there was a sale on nance since each glass held what seemed to be hundreds, looking like a myriad of little eyeballs peering through the glass. The benefit of our next stop (La Nueva Flor Blanca) was sitting next to the glass half-walled kitchen which gave us an opportunity to watch them make the pupusas from scratch. I ordered the pupusa de chicharrón (which I wisely negotiated going halfsies with one of the other diners), but was slightly disappointed after the meaty disk of joy at El Chipilin. We had planned a stop at El Carbanero (whose sign advertised 99 cent pupusas) but in my limited knowledge of Spanish I determined that you can only get the discount pupusas on Mondays and Thursdays. With our Salvadoran ballasts sloshing around, we skipped El Carbanero and headed for the last stop - the fancy Jaragua. The first thing that catches the eye at Jaragua is their pre-Colombian jungle-themed bar at the end of the room; in fact the drink menu was almost as big as the food menu. In addition to the old standards, I noticed a squash and cheese (ayote con queso) pupusa that I just had to have (and halve). As upscale as the surroundings were, the pupusas were still in the $2.50 range, and the delicata squash and cheese pupusa I ordered did not disappoint. From the first stop I noticed that the condiments were almost identical; a watery hot sauce and jars of curtido (a light mix of shredded cabbage, carrots and jalapenos in vinegar). I had had curtido before at the San Fernando Festival, using it to top a cheese and potato pupusa - to me it is the perfect substitute for otherwise bland cole slaw. I could eat a bowl of curtido all by itself, but it was remarkable that we had gone to four different pupuserias with not the slightest different in the taste of each restaurant's slaw. This entry was posted in South and Central America, Trippy Food (Tasty flora and fauna) and tagged arroz, Atlacatl, ayote con queso, Beverly Boulevard, CA, California, Central American, cheese, chicharrón, crawl, curtido, delicata, El Carbanero, El Chipilin, El Salvador, ensalada, festival, flour, harina, hominy, Jaragua, L.A., LA, loroco, Los Angeles, masa de maiz, nance, nixtamal, Nueva Flor Blanca, pork, pupusa, pupuseria, quesillo, revuelta, ruvuelta, Salvadoran, San Fernando, squash, The Minty. Bookmark the permalink. Hey Val, this is a great post. I love pupusas, but I knew nothing about them until now. Thanks. I agree with most of your tasting notes. Ensalada with a shot of rum? Genius. I was also surprised at how all of the curtido tasted pretty much the same, but I loved each one. Still bummed that I dropped off before Jaragua; I missed out on the cocktails. Thanks, Valentina, I learned a great deal after stuffing close to four of them in my face! I think I’m done for awhile. Nick, I enjoyed the crawl, but wisely did not go for the cocktails – I wan’t sure all those pupusas and alcohol was a safe combination! Hahah! Of course pupusas and booze together is great! After the crawl, I tried a few more cocktails but never got buzzed since I was so full of pupusas. Wait, maybe that is a bad thing. I need to check these out. Like Commenter #1, I’d never heard of pupusas until reading your post. They do sound like they’d go down quite nicely with cocktails. I wish it was a little later in the day at this moment so I could justify making my move on them right now. Gary, they can sit a little heavy – probably why they’re good booze sponges. Hold on another few hours, but if you’re thinking of pupusas and drinks, I’d go with Jaragua for their extensive cocktail menu. Living just 90 miles north of LA in Santa Barbara, I don’t believe we have a restaurant here that serves Pupusas. If you know of one here, I would love to try it. And I definitely agree with you on the ‘ensaladas’. If someone had told me to try it, I too would have thought it was a salad – LOL! A shot of rum in the drink would have completed it, I’m sure. Thanks for the education and awakening my palette. If you decide to check it out, update us on how the pupusas are there. I’m learning about new restaurants in this town every day. I haven’t heard of this restaurant, but I just checked the reviews on Yelp and they are solid. I’ll let you know what I think for sure. I know that this is a California centric article but I’d like to add something if I may. You’d might be surprised that this delicious food found can be found in Toronto as well. One place you might want to check out if you are ever in the Toronto area is El Sabor de El Salvador on St. Clair W.
Thanks for the tip, Jackie – I imagine you can find pupusas wherever you find Salvadoran expatriates – nice to see they’ve made it that far north! Pupusas revueltas stuffed with meat, beans and cheese is my favorite pupusa. I often order that or ask my wife to make it when she has a chance. Your wife makes them? Damn, James, you have one over on me! Feel free to elaborate on any other ethnic dishes she does, always looking for new things to try.